If your order weighs less than 13 ounces, save huge on shipping with USPS first class (with tracking number). This product weighs 36.3 oz. Nature’s Sunshine Ionic Minerals with Acai contain 70 trace minerals that are ready to be absorbed by the body. 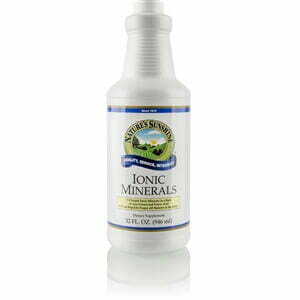 Ionic, or charged, minerals don’t need to be broken down by the body before absorption, making them easily availably for quick use for the different systems of the body. Nature’s Sunshine Ionic Minerals with Acai supports a healthy pH balance, supplies electrolytes, antioxidants, amino acids, essential fatty acids, and even helps rebuild the immune system. Acai is used to flavor this supplement, providing a refreshing berry taste. Instructions: Take 1 Tablespoon twice daily with a meal. Purified water, fulvic acid, vegetable glycerin, açai berry concentrate (Euterpe oleracea), red grapeskin extract (Vitis vinifera), tartaric acid, xanthan gum, sodium benzoate (preservative), citric acid, and acai berry (natural flavor).